If you want to retire wealthy, then you should invest in your retirement as early as possible. You should know that retirement investing is relatively time-sensitive. Building a healthy nest egg that you can use after you retire will allow you to enjoy the fruits of your labor when you were still able. There are many savings options that you can invest on to be able to create a desirable scenario with your life after retirement. These are namely 401(k), 503(b), IRA’s and pensions. These tools, along with other solid retirement investing tips, will greatly boost your retirement income. The average income of retirees (aged 65 years and up) is around $29,000 according to the Employee Benefit Research Institute in 2008. In 2007 it is around $28,000. Graduate degree holders earned around $62,000 and bachelor degree holders earned around $45,000. If you do the math, these figures are not quite desirable and could barely provide a comfortable life after retirement. 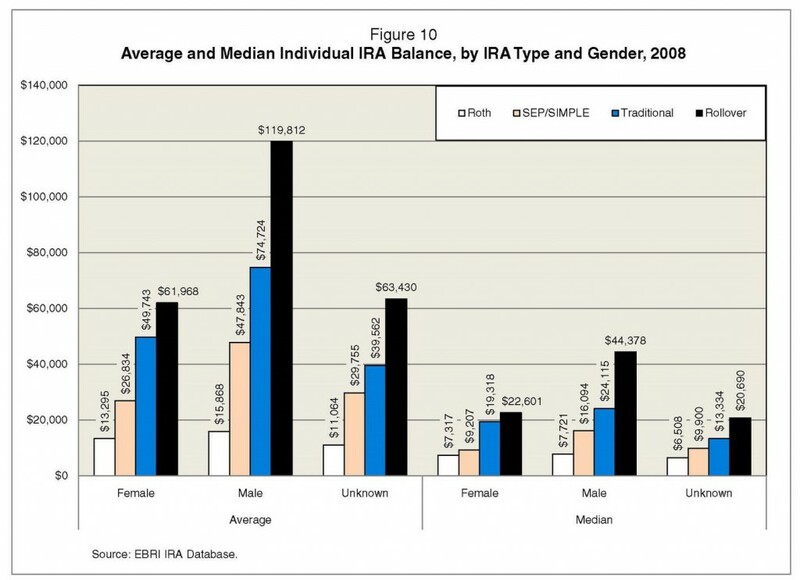 Take a look at the average individual IRA balance by IRA type and gender below. How do you currently compare? IRA’s or Individual Retirement Accounts provide tax incentives and advantages to individuals. These are retirement plans out of that employer sponsored ones and are generally a type of savings where funds can be placed on different investment options. These investment options determine the rate of returns with your IRA. Almost all types of investments can be held within an IRA namely stocks, bonds, mutual funds, Certificate of Deposits (CD’s), and more. Investment on CD’s are considered the safest while investment on stocks is considered risky. Somewhere in between the extremes in terms of both risks and returns are investments with bonds and mutual funds. Getting the average IRA interest rate if not the best IRA interest rate will be very significant in the years to come. Great rates mean great returns. Rates from IRA’s may differ from each brokerage firm. There are many discount brokers online that offers very attractive rates for individuals to encourage them in opening one with their firm. By comparing all their rates and comparing all the services that they offer you may be able to choose the best IRA company to be with. It might not have the best rates but you may find their offers very convenient. Or you may opt to go with big rates regardless of other services. It’s all up to you. If you are still in doubt and so confused with all the things concerning not only IRA’s but all financial matters, you can always consult your financial adviser. All of us want to retire and be able to still live a lavish life. With the cost of living increasing every year this would likely be too much to ask. But with the right attitude and practical thinking, anticipating all the possible hardships to come in life, we may be able to attain – maybe not a lavish life after retirement – but a good one may suffice. As much as possible and as early as possible, take advantage of the tools that the society provides for us to be able to gain enough income and savings. Get your Roth IRA opened today and max out your 401k contributions if possible. By this we can secure a much desirable post-employment life.